Being a little unsure of my fitness, I chose this race as a "competitive tempo run" of sorts as I had one (tempo run) on my schedule and the event started about 100 yards from my apartment. I have been going by a planned scheduled in training for Chicago and it is very different than the training I have done in the past where I have just coached myself. It is all leading up to one big peak, where in the past I have tended to get in good shape fast and then hold it. All this being said, this was the inaugural Greenville-Pitt County 8k Road Race and the course was interesting. It had a lot of slow inclines and declines and finished with about 2 miles straight up and down 10th Street in the sun. After my longest mileage week of the season, I was excited to see what my legs had in them. The race got off a few minutes late and I may have charged down Cotanche a little hard as I was in the lead at the left turn onto Reade St in front of Chico's. Soon up the half mile long hill, Phillip Rowan passed me on his way to a 55 year old age group state record. With more speed, I feel like I could have run with him. My stamina has been lacking a bit lately. Maybe it's because I've been hitting it hard for 18 months or so after not really competing for 12 years and maybe I am still developing this season. I hope the latter! Ran up 5th St and was passed by one more guy before the mile mark (5:45) before almost being hit by a sorority girl driving home. This happens a lot in Greenville, so it doesn't shock me. 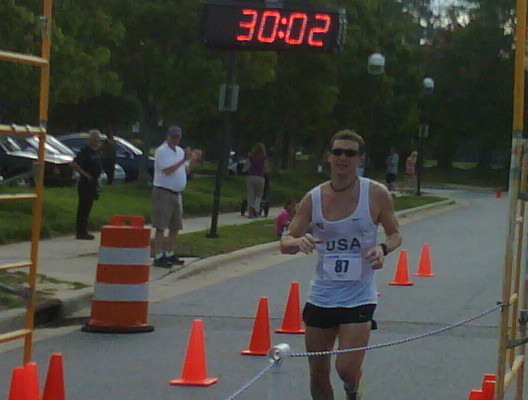 After this I cruised down Elm St and got into a pretty good groove before the 2 mile (11:43). Miles 3 and 4 were slow. I was in no man's land after turning it on during mile 2 and hit 3 up the hit on 5th St in 17:53 and 4 up and down 10th St in 24:07. Tried to focus on staying in 3rd in the final mile and staying straight up although I was pretty tired and my feet hurt. I was trying out a new pair of flats as my trusty Victory's are running out of racing miles and I am hoping to squeeze Virginia Beach and Chicago out of them before retiring them. Can't believe Nike discontinued those. I have raced 2 marathons and countless road races in them in the past year+ and they still feel pretty good. Anyways, I weaved through the mini-maze at the end where we turned around Joyner Library and the parking lot behind Wendy's to finish up in 30:02 or so. I was 45 seconds or so ahead of the next competitor, but not 100% pleased. At minimum, it was a great tempo run! Got in a long cool down to finish up a 60 mile week, which was my longest since February. Hoping that'll wake my legs up enough to race a half at not too much slower of a pace next weekend!